The Indigenous Lawyers Association of Queensland is delighted to announce the winners of the 2017 Attorney-General’s National Indigenous Legal Professional of the Year and National Indigenous Student of the Year. Former ILAQ President, Joshua Creamer has been awarded the 2017 National Indigenous Legal Professional of the Year in recognition for his outstanding contribution in championing the rights of Aboriginal and Torres Strait Islander people. 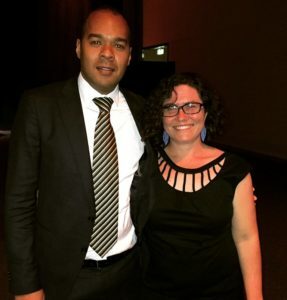 Joshua is one of eight Aboriginal and Torres Strait Islander barristers practicing in Queensland. Joshua’s dedicated contribution to providing legal services to the Aboriginal and Torres Strait Islander community was recently demonstrated with landmark case of Wotton v State of Queensland (No 5) FCA 1457. In 2017, Joshua was also appointed to the Board of Legal Aid Queensland. Current ILAQ Student and Media Representative, Michelle Rabbidge has been awarded the 2017 National Indigenous Student of the Year. Michelle is currently completing her final year of studies at the Queensland University of Technology. Michelle has been instrumental in assisting ILAQ throughout the year, including the increase in ILAQ’s social media presence, as well as volunteering her time to engage with our partners and stakeholders. Despite large workloads required by ILAQ, Michelle remains dedicated to improving and delivering outcomes from the Management Committee. Michelle has also dedicated her time to assisting other Aboriginal and Torres Strait Islander law students, most recently at the Aboriginal and Torres Strait Islander Student’s Moot competition. Michelle also works at the Aboriginal and Torres Strait Islander Legal Service. ILAQ congratulates Joshua and Michelle on their outstanding achievements.